A 100% acrylic emulsion designed for mixing with sand and cement. Ideal for repairing damaged, spalled, and cracked concrete surfaces. Exhibits outstanding strength for lasting repairs up to 1/2″ deep. One gallon of Concrete Patch Binder will produce enough patch mix (when mixed with sand and cement) to fill .86 square yard (approximately 7.75 square feet) at 1/4″ depth. 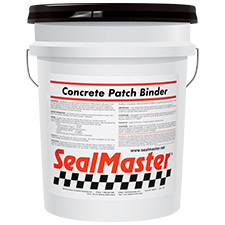 SealMaster® Concrete Patch Binder is a 100% acrylic emulsion that is mixed with portland cement and sand, producing a patch mix with superior flexural, adhesive, and impact strength, as well as excellent abrasion resistance. Patch mixes based on Concrete Patch Binder are ideal for repairing and resurfacing both interior and exterior concrete surfaces. Concrete surface must be cleaned entirely of dust, dirt, debris, oils, waxes, coatings, and other foreign materials. • Sand – 100 lbs. • Portland Cement (Type I) – 33 lbs. Thoroughly premix sand & cement together. • Concrete Patch Binder – 3.5 gals. *Additional water may be required to achieve workability. Apply patch mix (Concrete Patch Binder, Sand, Cement, Water – if needed) to properly prepared surface with a trowel or screed. For areas deeper than 1/2″ apply in lifts no greater than 1/2″ at a time. Final finish may be troweled, floated, or brushed. Allow surface to harden completely before opening to traffic. Wash tools, etc. in water before material dries.